Vintage From Paul is delighted to offer this pristine condition Eames Era Federal Glass Canadian Club Hi Ball Glass Set. The sets are unused and in their original boxes. The verbiage on the boxes reads: "Compliments of Hiram Walker, Glass Use care, Set of 6 No C-150 Canadian Club 10 oz Hi-Ball Glasses". Vintage fifties signed Federal Glass barware. 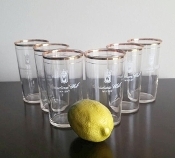 A sparkling six piece set of Canadian Club Whiskey advertising bar glasses with genuine 22 k gold rims and white enamel crests and script on clear glass. The Eames Era Federal Glass Canadian Club Hi Ball Glass stand 4-3/4 inches in height, measure 2-1/2 inches in diameter at the top, and they have a 10 fluid ounce capacity. The Federal Glass Spring Cocktail Glass Sets are in pristine condition with no defects noted. It appears that this set was never used. The box is in excellent condition, with only minor wear noted to its' lid.